With the creation of a formal NBOME emergency medicine COMAT exam, DO students now have yet another test to study for. Lucky for you, COMQUEST is here with a new collection of practice questions designed for the EM shelf. Their overview page answers the question about why to use it – you can’t guarantee you’ll see everything during your rotation. As you’ve probably heard several times now, active learning via practice questions is the best way to learn. If you’ve used COMQUEST’s services before you know the drill. There are 302 questions in the qBank, covering all six NBOME “tasks” and a wide range of appropriate sub-specialties (ie: derm, cards, MSK). You create your own exams, determining how many questions to do and in what mode. Modes include timed, un-timed, and tutor mode as timed or un-timed . Exams can be built to include all the EM shelf questions available, or limit to new, used, marked or incorrect. You can choose a single option or combine them (ie: only marked or incorrect). During exams you can mark the question to review later, and record whether or not you guessed on the question, a great feature that becomes important during review. We can easily tell ourselves we “knew” an answer after doing many questions, but that red guess box will remind you that wasn’t the case. With a simple click you’ll get way more out of your review than before. Post-exam is where the hard part of learning comes in and the most benefit is gained. Answers are provided with a brief, straightforward explanation. COMQUEST follows this with a more detailed “digging deeper” section that discusses the topic at length. At this point you can create “notes” for yourself that are useful for future review, and again mark questions. Finally, they list a “take home point” to reinforce the purpose of the question. One of the nice things about COMQUEST is its ChoiceTRAX feature, which records whether or not you changed your answer. This can be a great way to prove to yourself that sticking with your gut response is the right thing to do. COMQUEST also has PeerTRAX, which shares with you how long others spent on that question, versus your own time, and what percentage of other users got the question correct. On one hand, it’s great to see when your progress is going well. On the other, missing a question PeerTRAX lists 98% of test takers got correct in 37 seconds might be depressing. In the same vein, the dashboard provides a LOT of data, breaking down your overall exam score versus your peers, noting percentage of questions you guessed on and what your average time per question is. Further down, the EM shelf breakdown includes specialty, task, question difficulty, whether your answer was correct, peer percent correct, if you changed your answer, how long you spent on it, was it a guess and did you mark it for review. That is a LOT of data, and I’m unsure how useful it is in this format, but it never hurts to provide more data to nervous medical students. Far more useful is the “My Exams” screen, allowing you to see exams you’ve taken with information on type, your score and peer score. Under the exams heading is where you’ll find your “Notes,” a feature that can be used to review consistently-confusing or often-missed items during the week prior to your shelf. Studying for the EM shelf? 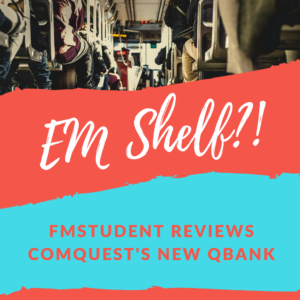 See FMstudent’s review of COMQUESTS new shelf-focused qBank! Worth the cost. The third year of medical school is all about performing well clinically and on shelf exams. If your school has a required EM rotation you want to do well on it. If it doesn’t you may choose to do an EM elective as part of preparation for applying FM. The best way to do well is more practice questions. Questions, questions, questions. For those that like a guide to start with COMQUEST has an overview of their entire interface, and changes they recently made in note making, search and site layout. UI: Clean and intuitive interface. Without any prep I was able to navigate the dashboard, immediately make an exam and learn something. FOCUSED: Questions on shelf are different from Level 1 and 2, and when I was a med student I found shelf-focused qBanks much better preparation for the NBOME’s shelf exams. Contributors include a total of 4 docs, and it’s unclear if that’s a plus or minus in such a new shelf exam.